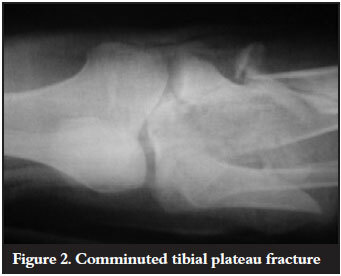 BACKGROUND: Bicondylar tibial plateau fractures are often associated with severe soft tissue injuries that can frequently result in compartment syndrome and are frequently open fractures. Operative management of these injuries is invariably complicated by the condition of the soft tissue envelope of the proximal tibia. METHODS: Between July 2008 and March 2009, 13 consecutive patients who sustained bicondylar tibial plateau fractures were treated with Ilizarov fine wire circular external fixators. These 13 patients were reviewed with regard to their functional outcome and any complications incurred during the management period. RESULTS: Eleven patients met the inclusion and exclusion criteria. All patients achieved bony union and had good functional results without serious complications. No osteomyelitis, septic arthritis, loss of reduction or wound dehiscence occurred. Superficial pin tract infection was the most common complication encountered, but in all cases pin site care and oral antibiotics were sufficient to eradicate the problem and no pins or wires needed to be removed or resited. CONCLUSION: The treatment of bicondylar tibial plateau fractures with the Ilizarov circular external fixator is safe and effective, and produces good functional results without serious complications. Tibial plateau fractures comprise a diverse group of injuries to a major weight-bearing joint, and are frequently associated with functional impairment.1 The most widely used classification system for these fractures was proposed by Schatzker,2 and divides these fractures into two groups, namely lowenergy and high-energy fracture patterns. Although the ideal method of fixation of these fractures remains controversial, a biological approach to the soft tissue envelope of the proximal tibia can help minimise some of the complications that often follow surgical intervention. The purpose of this study is to evaluate the management of these complex injuries with the Ilizarov tensioned fine wire circular external fixator. Particular attention is paid to the functional outcome of, and complications associated with, this treatment method. 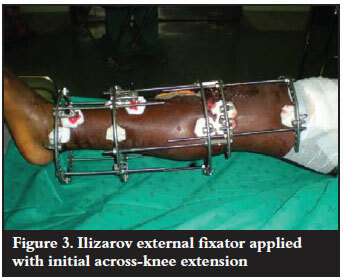 Between July 2008 and March 2009, 13 consecutive patients with high-energy bicondylar tibial plateau fractures were managed with the use of the Ilizarov circular external fixator. These 13 patient records were reviewed. Inclusion criteria were patients of skeletal maturity with bicondylar tibial plateau fractures that were treated with the Ilizarov circular external fixator. Patients were excluded if they had any of the following: (1) a condition that would impede the rehabilitation process of the patient - for example, acetabular fractures that would require prolonged immobilisation; (2) concomitant injuries that could alter the functional outcome of the patient - for example, ipsilateral femoral shaft fractures; (3) previous major trauma, surgery or deformity of the affected knee. Eleven patients met these criteria (Table I). One patient was excluded due to severe concomitant injuries, including head injury, blunt abdominal trauma, and a contralateral Gustilo-Anderson IIIB compound tibia fracture with 4 cm bone loss that also required an Ilizarov circular external fixator. The second patient was excluded because of a concomitant ipsilateral acetabulum fracture that required open reduction and internal fixation. All radiographs were reviewed. The fractures were classified using the Schatzker classification on the preoperative radiographs. Postoperative films were assessed for method and adequacy of reduction. The maintenance of reduction and union was evaluated on later follow-up radiographs. Of the 11 patients, eight were male and three female. The median age was 40 years, ranging from 19 to 59 years. Mechanism of injury included pedestrian vehicle accidents (n = 4), occupants in motor vehicle accidents (n = 3), fall from height (n = 3) and assault (n = 1). Ten patients had Schatzker VI fractures and one patient had a Schatzker V fracture. Open fractures were found in three cases and classified according to the Gustilo and Anderson classification as grade IIIA in one case, and IIIB in two cases (Figure 1 and 2).13 The remaining eight cases were all associated with extensive closed soft tissue injuries and were graded according the classification proposed by Tscherne and Gotzen.14 All open fractures were initially treated with debridement, irrigation and antibiotics. One of these patients was also found to have compartment syndrome and underwent emergent fasciotomy at the time of initial debridement. One patient with an open fracture had an initial joint spanning monolateral external fixator applied after debridement. All three patients with open fractures required an additional soft tissue procedure: split skin graft, fasciocutaneous flap, and a myocutaneous flap respectively (Table II). Three patients had associated musculoskeletal injuries. Contralateral femoral shaft fractures (n = 2) were treated with antegrade femoral nailing. 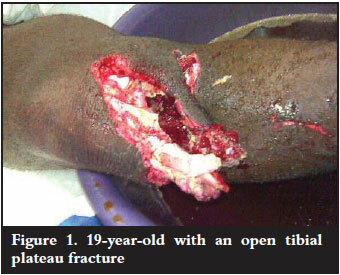 One patient had bilateral tibial plateau fractures. His contralateral plateau fracture (Schatzker IV) was treated with a lateral locking plate at the time of Ilizarov application. The average time to surgery was 10.1 days, ranging from 2 to 22 days. The delay in definitive management was as a result of a combination of factors including: delay in referral from peripheral centres, delays in acquiring CT scans, and lack of theatre time availability. All the definitive surgeries were performed by the primary author, and the Ilizarov system (Smith & Nephew) was used in all cases. A four-ring construct was employed, with a 5/8 ring proximally to allow greater knee flexion. For proximal ring block fixation, 1.8 mm tensioned wires were used and a combination of 1.8 mm tensioned wires and hydroxyapatite half pins were used in the distal ring block. 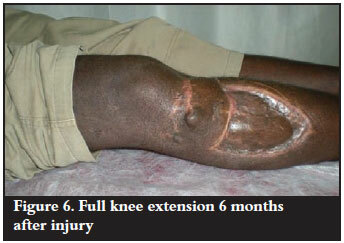 One case required an initial aboveknee Ilizarov extension for 6 weeks, in order to allow a soft tissue flap anterior to the knee to heal, prior to allowing knee mobilisation (Figure 3). All 11 patients had limited open reduction and eight patients had additional percutaneous cannulated screw fixation (Figure 4). One patient had iliac crest bone graft at the time of frame application, and another required iliac crest bone graft for a metaphyseo-diaphyseal non-union. Pin site care comprised initial absorbent dressings for five days post surgery, followed by twice-daily cleaning with saline or soapy water until the skinpin interface had healed. If pin site infection occurred, the patient was instructed to recommence the pin site cleaning and a course of oral antibiotics was prescribed. Particular attention was paid to anatomical safe zones with wire placement, and no intra-operative iatrogenic nerve or vascular injury occurred. Ankle equinus deformity was prevented by meticulous wire placement technique, active joint mobilisation post-operatively and splinting of the foot in a neutral position. Early range of movement exercises for the knee and mobilisation with crutches was encouraged in all cases. Weight bearing was delayed for approximately six weeks after which proprioceptive retraining was commenced and progressive weight bearing encouraged until full weight bearing with or without walking aids was achieved. After discharge, patients attended the orthopaedic outpatient clinic. On these follow-up visits patients were assessed for any complications, including soft tissue complications, infection or loss of reduction. Functional outcome was also determined using the Knee Society Clinical Rating Score. The external fixator was removed once radiographic evidence of union was established. All fractures united at a median of 22 weeks, ranging from 17 to 39 weeks. One patient required additional iliac crest autologous bone graft for a metaphyseo-diaphyseal non-union at 24 weeks. 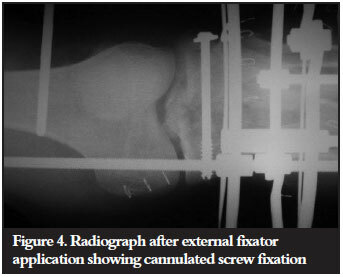 The bone grafting was performed without adjustment of the external fixator and union was achieved 15 weeks later after which the external fixator was removed. During visits to the orthopaedic outpatient department, follow-up radiographs were taken. No loss of reduction occurred after frame application. Knee Society Clinical Rating scores ranged from 62.5 to 97, translating into a good result on average (Table III). Based on the scores, six outcomes were excellent, two good and three fair (Figure 5 and 6). Average range of motion of the knee was 109º (range 90º to 125º). Seven of the patients ambulated without support while four required a cane to aid mobilisation. 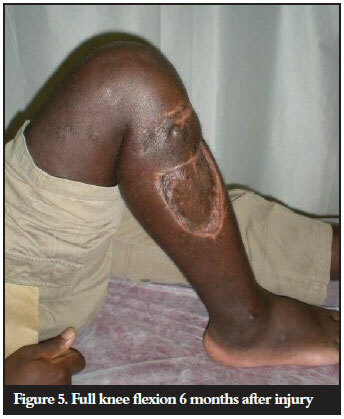 Pin site infection was a common complication, diagnosed in six of the eleven patients (66%). However, all these cases responded to pin site care and oral antibiotics, and none of the pins or wires needed to be removed or resited. No cases of wound dehiscence, infection, osteomyelitis or septic arthritis were encountered, and no patient required removal of the external fixator prior to fracture union. The treatment goal for bicondylar tibial plateau fractures is to obtain a stable, aligned, painless and mobile knee and to minimise the risk of post-traumatic osteoarthritis. In order to achieve this outcome the value of early joint mobilisation has been well established by the work of Apley.15,16 Fracture reduction and stable fixation is required to allow early joint motion. The inherent mechanical disadvantage of a monolateral fixator arises from the cantilever loading forces which they are subjected to, producing increasingly less stable fixation further away from the fixator. Ring fixators, like the Ilizarov system, with tensioned fine wires, utilise beam loading to create uniform support for the joint and stable fracture immobilisation to achieve fracture union. Recent biomechanical studies proved that fine-wire fixators provide adequate mechanical stability for the fixation of bicondylar tibial plateau fractures.22,23 Watson et al. demonstrated that four olive wires combined with a lag screw provided the most stability, even when compared to dual plating.23 This allows for early joint mobilisation without risking loss of reduction. Several published studies have shown decreased complications when treating bicondylar tibial plateau fractures with fine-wire external fixators. Kataria et al. reported on a series of 38 patients treated with small-wire external fixators and had no incidences of non-union or septic arthritis.24 Ali et al. reported on 20 patients treated with a hybrid external fixator, in which all patients achieved bony union and no patients developed osteomyelitis or septic arthritis.3 In a series by Dendrinos, 24 patients were treated with the Ilizarov circular fixator, and there was no incidence of osteomyelitis or septic arthritis.25 Chin et al. reported similar results of 18 patients, none of whom developed wound dehiscence, infection, osteomyelitis or septic arthritis.26 The current series is comparable to these studies in that no cases of wound dehiscence, infection, osteomyelitis or septic arthritis were encountered. From these results it appears that a fine-wire external fixator with or without limited open reduction, succeeds in providing stable fixation for these complex injuries without imparting added trauma to an already compromised soft tissue envelope. Limitations of this paper include the small number of cases and the retrospective nature of the review. Also, the exclusion of patients with certain concomitant injuries could lead to a selection bias, possibly omitting patients with more severe injuries. Ilizarov circular external fixation is a safe, effective treatment option for bicondylar tibial plateau fractures, with good functional results. This technique is very attractive in patients with severe damage to the soft tissue envelope of the proximal tibia which would make open reduction with extensive surgical dissection less desirable. Seeing as these patients often suffer articular surface damage at the time of injury, it might be reasonable to expect that a large proportion might require knee arthroplasty at a later stage. A possible further advantage of this treatment modality is the fact that minimal dissection is performed, and minimal metal ware is left in situ. This might prove advantageous at the time of arthroplasty surgery. Further research in this regard is necessary. The content of this article is the sole work of the authors. No benefits of any form have been received or will be received from a commercial party related directly or indi rectly to the subject of this article. The research has been approved by an ethical committee.